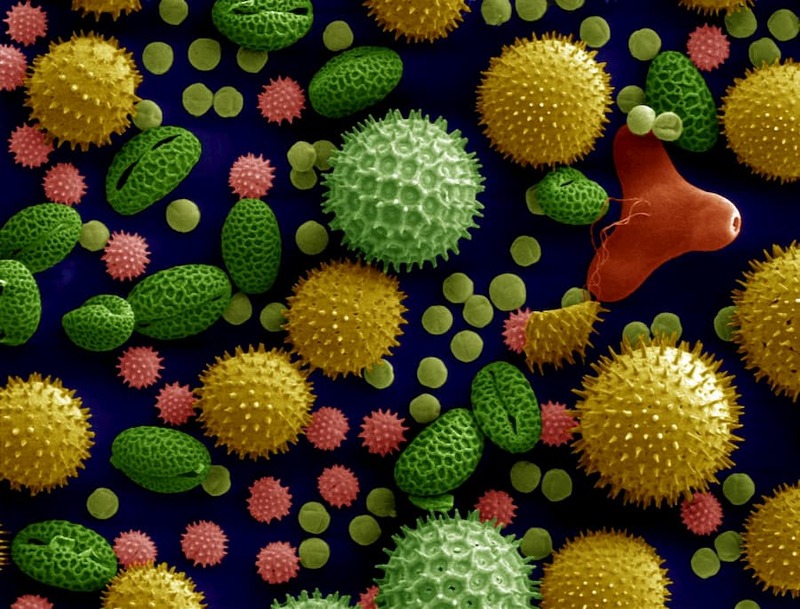 The exine, or outer layer of a pollen grain or spore, is extremely varied in structure. Decades of research have attempted to discover the underlying developmental mechanisms that give rise to the enormous diversity of pollen and spore exines. The organization of the exine starts with the establishment of an elaborate glycocalyx, a cell coat, within which the subsequent accumulation of sporopollenin occurs. Ontogenetic studies using transmission electron microscopy of over 30 species from many different groups have shown that the sequence of structures observed during development of the exine corresponds to the sequence of self-assembling micellar mesophases (including liquid crystals) observed at increasing concentrations of surfactants. This suggested that self-assembly plays an important part in exine pattern determination. Some patterns resembling separate layers of spore and pollen grain walls have been obtained experimentally, in vitro, by self-assembly. However, to firmly establish this idea, columellate and granulate exines, the most widespread forms, needed to be simulated experimentally. Gabarayeva and colleagues prepared mixtures of substances analogous to those known to occur in the periplasmic space of developing microspores, then left the mixtures undisturbed for specific periods of time to allow the process of self-assembly to occur. They developed their method further by using new substances analogous to those present in the periplasmic space and performing the experiments in a thin layer, more closely resembling the dimensions of the periplasmic space. Their results show that simple physico-chemical interactions are able to generate patterns resembling those found in exines, supporting the idea that exine development in nature involves an interplay between the genome and self-assembly.